A Day Late and A Dollar Short: Groupon - ATL - PPG Porter Paints - 50% Off! 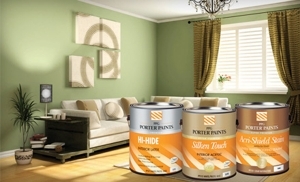 Groupon - ATL - PPG Porter Paints - 50% Off! A bucket of paint can transform a dreadful-looking picket fence into an American symbol and a 1987 station wagon into a mobile tribute to Jackson Pollock. Colorize a less-than-vibrant facet of your day with today's Groupon: for $30, you get $60 worth of interior and exterior paints, stains, and primers at PPG Porter Paints, which has 24 area locations. PPG Porter Paints' team has dedicated 90 years to sprucing up homes with its revered brand of vivid, low-odor paints, stains, and primers. Multiple lines and sheens of interior paint offer to protect walls from presidential portraits painted in mustard ($25.79+/gal.). Eco-conscious shoppers can snag gallons of Pure Performance color, designed to thwart mold and mildew without angering Mother Nature's overprotective rottweiler ($33.39+/gal.). Peruse exterior paints if looking to prevent al fresco fortifications from cracking and peeling during super-soaker season ($25.79+/gal.). Effective on most surfaces, Porter's acrylic, synthetic, and alkyd Seal Grip primers also help house-wide paint jobs to stay put ($40+/gal.). Amicable staff members roam each locale's voluminous aisles and are eager to provide product recommendations for any home, office, or abandoned grain silo. Though PPG Porter Paints sometimes features a discounted price online, this Groupon still offers the best deal available. Limit 1 per person, may buy 1 additional as a gift. Limit 1 per visit. Not valid for sale items or paint supplies. Valid only for PPG Porter Branded Products, Pure Performance, Accent Color Base, and Seal Grip Primers. Visit the Groupon ATL website to purchase. *This deal is only available for three (3) days.